One new company, possibly two, will be competing with Peru Rail later this year, providing more railroad services on the highly-prized line to the pre-hispanic citadel of Machu Picchu, Peru’s key tourist attraction. The first company to be granted the license is Inca Rail, formed by the Peruvian company Grupo Crosland and Turistren of Colombia as the operator. According to Juan Alberto Forsyth of Crosland, the company expects to begin the service in October with one triple-car train for 150 passengers and will add two more triple trains by the end of the year. The second company expecting to be given the green light is Andean Railways Corp, which met the Ministry of Transportation requirements last week and is now waiting for the approval of Ferrocarril Transandino, which operates and maintains the railway line. ARC’s main operating shareholder is Iowa Pacific Holdings, Chicago, a conglomerate of railway companies operating in Texas, New Mexico, Arizona, Colorado and Illinois. 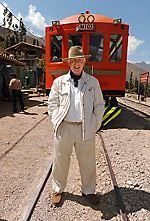 Nicholas Asheshov, one of the British investors, with Christopher Roper, both with long-standing connections in Peru, told Peruvian Times that Iowa Pacific’s focus is on freight but they have a long-established tourist/passenger company in Colorado and another that specializes in old trains which run all over the US and Canada. Andean Railways aims to corner 20% of the 500,000 tourists that visit Machu Picchu every year. Both companies plan to offer first-class railcars as well as economy class. A third company, Wyoming Railway, has been granted a preliminary license but has yet to present its proposals to the Ministry of Transport. For the past nine years, since the national railway system was privatized, the sole service to Machu Picchu has been provided by Peru Rail, operated by Orient Express Hotels Ltd and owned equally by the famous travel company and Peruval Corp, with interests in tourism, real estate and infrastructure. However, an antitrust ruling last year by Indecopi, the national copyright and fair competition institute, opened the door to competitors. Ferrocarril Transandino, as operator of the railway line, has been critical of the Ministry of Transport’s decision to “lower the barriers” to companies it does not consider on a par with Peru Rail. Ferrocarril Transandino has been operating the railway line since 1999, when it won the bid for a 30-year concession to operate, expand and maintain not only the 124 km narrow gauge line to Machu Picchu, but also the standard gauge 800 km line from Matarani and Mollendo on the coast to Arequipa, Puno and Cusco. Within the next week, it will be posting a bid for timetables. Inca Rail has shown an interest in three daily schedules, while Andean Railways is aiming to request four. Inca Rail will be running its service between Urubamba, Ollantaytambo and Machu Picchu and has acquired land in Ollantaytambo for its yard. It is investing $4 million, which has included the purchase of the narrow gauge cars in Portugal, for outfitting in Peru. Crosland’s earlier experience in the railway business has been to supply locomotives to Enafer, the Peruvian railway system prior to privatization, and to the former state mining company Centromin as well as to its main client, Southern Copper Corporation. Forsyth stressed, however, that this only involved supply and after-market support, which is why the company brought in Turistren as a partner. This entry was posted in Business and tagged machu picchu peru, nick asheshov, peru rail, railway companies.